Government has formed ‘Bangladesh Journalists Welfare Trust’ for providing financial assistance to the journalists who are ill, financially insolvent, injured and deceased. Prime Minister Shiekh Hasina on Wednesday said the government will publish quickly the gazette of the ninth wage board award after scrutinising the recommendations submitted by the wage board. “The ninth wage board has recommended to pay 45 per cent dearness allowance (DA) for the media workers of all the newspapers,” she said while responding to a starred question placed by treasury bench lawmaker Mostafizur Rahman Chowdhury of Chattagram-16 in the Jatiya Sangsad with Speaker Dr Shirin Sharmin Chaudhury in the chair. The government has announced the ninth wage board and the government is taking active role to implement the wage board award for all the journalists, the PM told the House. 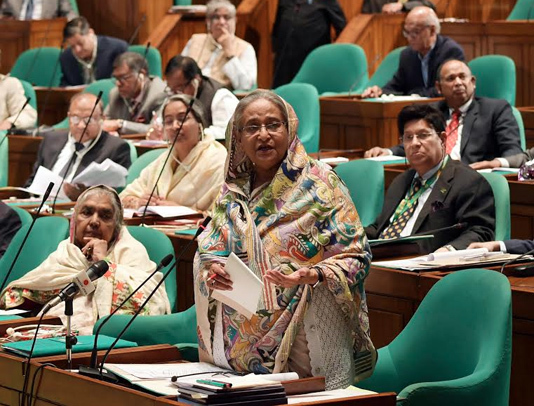 Sheikh Hasina said the government has been forming wage board regularly after each five years to ensure remunerations and other benefits for the journalists and media workers. Besides, the government has enacted mass media workers (service and condition) act in order to ensure services for the mass media workers at press and electronic media, the PM added. About the broadcast act, 2018, the leader of the house said the cabinet has approved the draft of the broadcast act in principle in October 15 in last year, adding that there is ample scope to take legal action against the television channels if they broadcast fake news. A total of Taka 10.07 crore financial assistance was given to some 1,396 journalists from the trust between 2011-12 and 2018-19 fiscal year, said the Prime Minister.